It saddens me that because of this, she has decided not to release her book. I personally have not read it, but from what I read on her blog, it sounds like she poured her heart and soul into it. I know exactly how she feels. Let me explain how hard this process is for a writer. In August 2011, I started writing a story on this blog, Death of a Cantankerous Old Coot. It was just for a few friends and another Facebook group. They all encouraged me to publish it. I was a bit hesitant…ok, I was terrified. Publishing a book has always been a dream of mine, but to have the dream come close to reality was frightening. I did share it with a publisher, who liked the story, but they wanted me to make it longer. I didn’t agree; I felt it would take away from the story. So with the help of a good friend, who designed a cover and formatted it for me, I self-published the book on Amazon and Nook. Then I waited. The waiting was the hard part. Sales were awful for the first four months. I had started my second book, Death Makes the Front Page, but with sales so bad, I was having second thoughts. But suddenly, sales took off and I felt brave enough to publish the next one. There are now five Lizzie Crenshaw mysteries that I have self-published, and I am working on a sixth one, plus two new series. Every writer deals with rejection. We all struggle, hope and pray that our stories will be accepted by people. These stories are a part of us; they are our babies. We spend countless hours working on them. We give up precious family time, sleep, sanity (although many in my family question my sanity on a daily basis) to tell the type of story we want to share with others. Then we send it off to beta readers and editors, breathlessly and nervously waiting to find out what they think. We cringe at the notes we get back, scratching our heads at how we screwed up one part so much. We make the changes, send it to the editors and pray (writers pray a LOT) that people will enjoy our efforts. With the help of friends, we spread the word of the upcoming release. Word of mouth helps writers tremendously. What happened to Lauren is a writer’s worst nightmare. What is worse about this situation is that the book has not even been released, yet people are giving it bad ratings and trashing her. She has tried to get help from the administrators of the website, but they say it is all within the rules. Help a writer. Read their books, give an honest review. If you don’t like their books, explain why. Most writers do provide their email addresses, and we love hearing from our readers. Tell us what you like or don’t like about the story. I always read all the emails I get, and I pay close attention when they tell me there is something they don’t like. I do my best to fix the things they point out to me. They also send me great story suggestions, and I do use them! I feel sorry for Lauren Howard. I hate that she isn’t going to publish her story, but I respect her decision. I hope that she writes another one and has the courage to publish it. I will be one of the first ones to read it when she does. What Happens When a Witch Meets a Reporter? Seems like our little Lizzie is trying to stay out of trouble these days. Instead of finding herself in a calamity, she’s been trying to get back to writing. While researching her latest novel, Lizzie realized she needed a source with intimate knowledge of all things magic. An inside source connected her with one of America’s most powerful witches, Sydlynn Hayle of the Hayle Coven Novels by Patti Larsen. Lizzie and Syd met for lunch and sat down to chat. Of course, as ladies are prone to do, the conversation quickly turned personal as they discussed everything from boys to dreams, and of course, magic. Lizzie: Sydlynn, I have a question for you that I am pretty sure everyone is dying to know. What does magic feel like? Is it anything like butterflies in your stomach, because when I have those something is usually about to blow up. Sydlynn: It prevented me from using my magic without woofing cookies. Not so fun. But now that’s been taken care of… it’s really an amazing feeling. Depending on which power I’m using—I have access to many—the feeling is different. Using fire heats me up, air usually gives me goosebumps. But the best part is you can sense the whole world around you when you’re using magic. I love it now. How do you stay safe with no magic? I couldn’t imagine… normals have things so tough! Lizzie: I don’t think I would be safe even with magic. I’m a natural born klutz. Put me in a car, I’m fine. But the moment I get out of the car, all bets are off. I do think being able to use magic would have been helpful when I got shot, though. Maybe I could have found a way to avoid that. What kind of powers do you have? Sydlynn: Well, I was born a witch to a demon father, so both of those apply. So I have access to all the elements thanks to Mom and more fire power through Dad. I also have a reincarnated Sidhe (fairy) princess who hitchhikes along, named Shaylee, so my Earth power is enhanced. And I’m also home to the essence of all vampires (don’t ask—long story), so my spirit magic has a boost. Oh, and sorcery, the dark, devouring magic. It’s a bit of a balance, considering all of my magicks have personas who are rather vocal in their opinions. Good thing we work together so well or I’d have lost my marbles ages ago. Lizzie: Didn’t having powers make high school difficult? What about college? Sydlynn: It really, really did, especially when I wasn’t in control of them. My demon tried so hard to get out those days, while Gram’s geas kept my witch power pent up. Trouble is, bottling up magic just makes it more interesting when the top blows off. Let’s just say it took a long time before I made any friends. As for college, I was fortunate enough to go to Coven Hall at Harvard with other witches. So at least my magic wasn’t an issue. Being Sydlynn Hayle, daughter of the High Council Leader, on the other hand… life is never boring. How is it you always seem to be in the middle of a mystery? Trust me, I know the feeling. Lizzie: When I moved back home, things were still relatively quiet. I spent most of my time working on my book, which I still haven’t finished. But ever since my crazy half-aunt killed my grandfather, my world has been turned upside down. Now, I always seem to find myself in the middle of a disaster. When you have a crazy aunt you are afraid wants to kill you, well…I could use a little extra fire power. Do you think having magic makes it easier to be brave? Sydlynn: I can so relate. Seems like trouble just jumps out of the woodwork with my name written all over it. Sigh. I don’t know that having magic makes me braver. I just see something that needs to be done and fix it. Okay, so I’m a little impulsive. So far, so alive. Lizzie: Not to sound like a college entrance essay, but how did magic help you get out of your worst situation? Sydlynn: Considering magic often gets me INTO my worst situations? Yeah. Balance, right? And there are so many times to choose from… I’ll have to get back to you. Lizzie: Living in a coven is probably a lot like living in a small town. Everyone knows your business, right? How do you cope with that? Everything I do gets spread around by the town gossip. Sydlynn: Oh. My. Swearword. Used to drive me around the bend and into fits. Not only is the coven in my business 24/7 physically, they are magically, too. We’re all connected through the family power, which means if I’m not careful, they know what I’m thinking, doing… talk about embarrassing. There used to be a time they didn’t trust me, back when I couldn’t use my power. But, all that’s changed and I’ve come to love it, really. Taking over from Mom, being coven leader and finally understanding how important their support is makes a big difference. Family is everything. Yours sounds as convoluted as mine. How do you feel about them? Lizzie: My father died when I was 18, but he was a wonderful man. I miss him every day. My mother is my rock. She may not always agree or approve of the things I do, but she stands by me through thick and thin. My grandmother, who left me her house, was a strong woman who taught me to stand up for what I believe in. My grandfather was a mean, spiteful man who thought he ruled the town because his family was one of the founders of Brookdale. If I learned anything from him, I suppose it would be how to treat people with respect. It was the one thing he could never do. As for my crazy half-aunt, I don’t think I’ve sorted out all my feelings about her yet. She put me through a lot the last few months. I’m still trying to sort through everything that happened. There’s also my extended family, my friends who have stood by me through thick and thin. I could live without the grief I get from the local gossip, though. And speaking of gossip, I hear you and I have a similar affliction. You have more than one guy after your heart. I’m caught between the man I think I love and my first love. How in the world do you choose? Sydlynn: *sigh* In all honesty, there is only one man for me. We are destined for each other. Even have power tying us together. But that doesn’t mean the road is smooth sailing… and when he’s being a jerkasaurus, doing his own thing, I refuse to wait for him. So, there are lots of lovely men in my life But I know Quaid is my fate. Tell me about this FBI agent? Is he cute? And your other love… I feel your pain! But what’s holding you back from choosing between them? Lizzie: TJ is very cute, in a rugged, outdoorsman kind of way. Jake was my college sweetheart. I thought for sure that we would get married. But I didn’t like the way he was trying to micromanage my life. He was so busy planning out our future that he didn’t stop to ask me how I felt about it. I realized I didn’t want to live my life that way. When I found out that Jake was planning to promise me to at a party the night we graduated from college, I ran. As for TJ, he is everything I could ever ask for in a man: kind, considerate, protective, a great listener, very passionate. He was working undercover as a deputy’s sheriff, and he was using me to get information about my crazy half-aunt. I was deeply hurt when I found out the truth, but I still saved his life when she tried to kill him. I love him, but I’m not sure if I can trust him again. Jake always has something up his sleeve, like an ulterior motive for everything he does. He tells me he’s changed, but I don’t know if that is true or not. Sometimes I still feel like he is trying to control a part of my life. With Jake, I always feel like I’m waiting for the other shoe to drop. What was it like to be forced into marriage? Sydlynn: Well… it’s coven law, unfortunately. And while I fought it for as long as I could, I knew I had to choose. And Liam is lovely, truly lovely. My oak tree. Kind and supportive. No one seems to think he’s strong enough for me, but I love him and he’s good to me. That’s all that matters. I have a cat Sassafras (well, he’s a demon boy in a silver Persian, but it still counts) and a dog Galleytrot (um… he’s a man forced to wear the body of a hound by the Wild Hunt. I have weird pets.) I take it you like animals, too? Lizzie: Absolutely! I have two dogs. I guess you could consider them rescue dogs. Babe, the bloodhound, was my grandfather’s dog. His wife, Earline, hated Babe and was planning to turn her over to Animal Control. There was no way I was going to let that happen, so I impulsively said I would take her. Mittens, the Maltese, belonged to a friend who ran the local animal shelter. When her owner was killed in a case of mistaken identity, I brought Mittens home with me. She and Babe get along great. They helped me solve a case a couple of months ago. I can’t imagine my life without them. Sydlynn: I live in a small town called Wilding Springs. It’s an… interesting place. What’s Brookdale like? Lizzie: It’s a small Texas town. There aren’t a lot of big retail stores here, mostly Mom and Pop places that have been around for years. It is starting to grow a bit because people that have been living in the big city realize that small town life is better than the high crime rate in the Metroplex. The downside of living in a small town is, of course, the gossip. I can get into an argument with someone in the town square at 10:30 am, and by the time I go to my mother’s house at noon, she has heard four different versions of the story, and usually none of them the right one. Despite that, I love it here. I can’t imagine living anywhere else. Lizzie: If you weren’t a witch, what would you do? Sydlynn: At this point, I have no idea. I’ve fully embraced being a witch, coven leader. I’ve had a time or two where my magic has been taken away from me. The first time, I thought it was what I wanted. The second, I had to make a choice. Both times I realized just how wrong the whole situation felt. So, if I couldn’t be a witch, I wouldn’t want to be. I’m going to turn this question around on you: if you could be anything, what would you do? Lizzie: Bestselling author, of course! *laughs* Seriously, I’m not sure. I was given an opportunity to run the town newspaper for a few months, and I found myself really enjoying it. The owner, who left me in charge, has come back to town, and I’m not sure where I stand at the moment. I hope he will let me stay there so I can learn more about the business. If he doesn’t want me to stay, I might look for another newspaper job somewhere else. I’m open to anything right now, and I’ll go wherever life takes me. Excuse me while I go have a total fan-girl moment. What I would not give to join these two for a lunch date. Want to know more about Syd and the Hayle Coven? 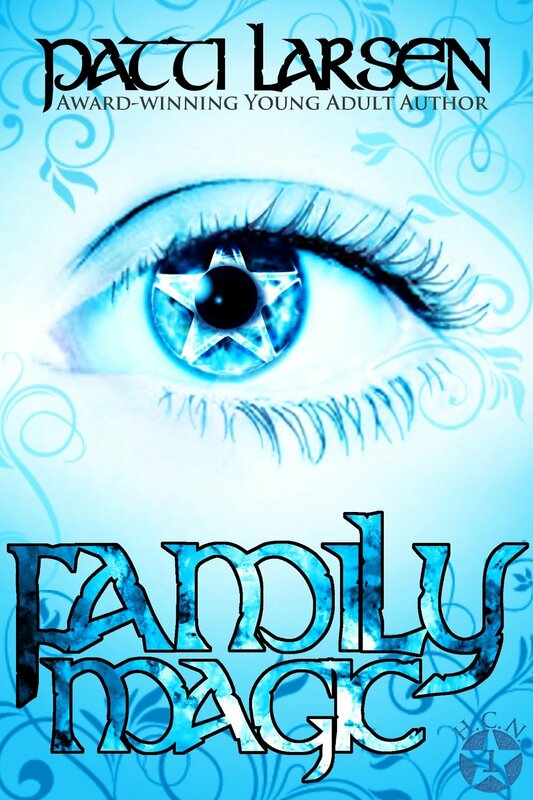 Check out Family Magic, book one of the Hayle Coven Novels, on sale now for 99 cents. 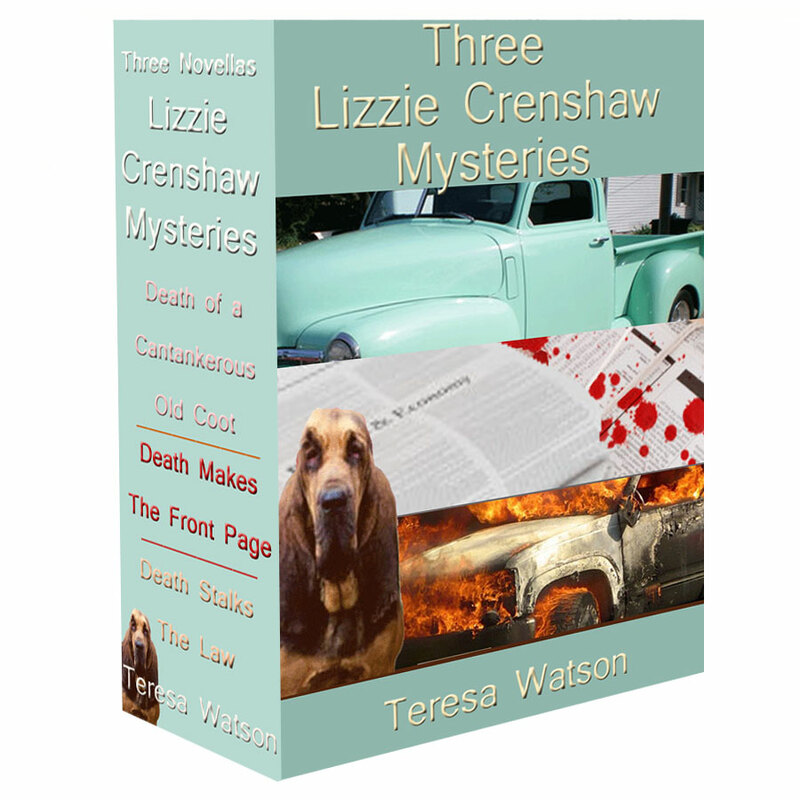 And of course, The Lizzie Crenshaw Mysteries Box Set includes the first three Lizzie stories for 1.99.